Features Percy's original Playing the Bones instructions. Get this twelve-page illustrated booklet FREE with the purchase of any Danforth Bones. African Blackwood is a dark heavy rare exotic rosewood favored by many wind instrument makers over ebony. The tree is native to Africa and delivers a strong powerful tone. 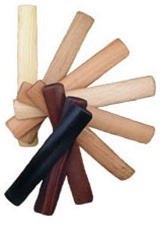 Many wind instrument makers favor African Blackwood over ebony. Like ebony, blackwood is quite hard and dense and quickly dulls saw blades. Its oily nature and high tolerance to climate changes make blackwood a good instrument wood for bone players and all musicians. Although pricy, African Blackwood, a member of the rosewood family, is a bargain compared to ebony. African Blackwood grows throughout central Africa. The tree is also reported to grow in western India. Since the reported specific gravity is 1.0 (same as water) I tossed a pair of Danforth African Blackwood Bones into a bucket of water, and sure enough, they sank like a rock. Ultra-soft and light-weight yet durable cedar bones produce warm tone with a punch. Percy Danforth preferred pine because of the soft pleasing tone the wood produced. But I can't help but wonder what Percy would have thought of these ultra-soft Cedar bones. "Interesting with the cedar, the fragrance started coming out as I was playing them." Personally, I prefer medium to heavy weight bones because they provide the kinetic force I need to make them click with ease. But if you want to try an "ultra-light" pair of bones with exceptional structural rigidity that generates a pleasing tone (plus a pleasing scent) that Percy himself would surely have loved, then these Danforth Cedar bones are for you. Cherry is a moderately heavy, strong, stiff wood from the Appalachian Mountains that delivers a mild to medium tone. Cherry is one of the most sought after hardwoods among fine woodworkers because of its smooth uniform texture, medium weight and hardness. This premium reddish-brown American hardwood turns darker and more rich as it ages. It is prized for its natural luster, attractive grain, and sumptuous warm glow. Might reappear if enough demand: Click "Email me when Back-In-Stock" link (near add to cart button). Ebony was the wood of choice for Mister Bones on the professional minstrel stage. Danforth Ebony Bones have been discontinued. The closest alternative is Pea Patch Minstrel-style Ebony Bones (narrow). For other alternatives see our selection of Minstrel Style Bones. Ebony is one of the world's hardest woods. It is a dense resonant material that holds a reputation among woodcrafters as a saw buster. In 1897 you could buy a set of four 7" ebony bones for thirty-five cents in the Sears, Roebuck & Co. catalog. Living history performers who do Minstrel era and Civil War gigs should choose Danforth ebony bones for the historically accurate design. And you (as well as those curious onlookers) will appreciate the sharp powerful tone that cuts through the clamor of the festival crowds. Percy Danforth Ebony Bones demo video. Musical segment features Boatman's Dance from Forgotten Times Forgotten Music. What the heck are gray virgin maple bones? These are the same as regular virgin maple bones except the color is taupe (grayish brown). The wood for these bones comes from "virgin" maple trees. Also known as "old growth" wood, these venerable maple trees grew for hundreds of years in a forest that had never been logged before. These particular bones are fashioned from maple trees that were harvested from virgin Wisconsin forests standing long before the Declaration of Independence was signed. The logs were recently discovered at the bottom of Lake Superior. They sunk over 100 years ago when the tree trunks were lashed together in huge rafts towed down to Chicago. The frigid waters preserved the ancient wood in impeccable condition. The wood is very close grained. "This is real wood," says Ray Schairer who has crafted Danforth bones since 1976. "You don't often see wood like this anymore," he notes. The sound is different too, sharper and crisper than bones made from the same conventional woods. These old hickory sticks rattle up spirits of the lamentable slave trade! Don't know if Andrew Jackson played bones or not. But "Old Hickory" was an early proponent of the banjar and he was known to dance to the fiddling of slaves. So it is not hard to imagine the rattlin' of the bones wafting through the slave quarters of his Hermitage estate. Jackson was nicknamed Old Hickory because he was renowned for his toughness. And hickory bones are indeed hard and tough. So the next time you need to deliver a medium-sharp tone that cuts through the din, just bring along a pair of these Danforth hickory sticks. The wide variability in color has enabled many look-alike species to be marketed as mahogany. Swirl and crotch figures are also common. Irregularities in the grain often produce highly attractive figures such as, fiddleback, blister, stripe or roe, and mottle. Many players prefer maple because it produces a nice warm tone. But I also enjoy playing bones made of all kinds of materials. And I like to mix and match them too. So it would not be unusual to see me play a wooden bone with a rib bone. Or sometimes a knife, fork or spoon - or even a pumpkin stem! So if you want a relatively soft-sounding pair of bones that won't pierce your ear drums, then try these Danforth Maple bones and discover for yourself what all this maple hubbub is about. You can get Danforth bones in a variety of woods, but Percy preferred pine because of the soft pleasing tone the wood produced. The thunderous clack of ebony and rosewood bones reined supreme during the Minstrel era. But Percy, as well as many other experienced players today, often shy away from those heavier weight and sharper tone woods. Personally, I prefer medium to heavy weight bones because they provide the kinetic force I need to make them click with ease. But if you want to try a "feather-light" pair that generates a tone about as pleasingly soft as musical rhythm bones can get, then these Danforth Pine bones are for you. Reclaimed Pine from 100-year-old barn. These Pine bones are made of wood reclaimed from a 100-year-old Michigan barn that was torn down to make room for a subdivision. As you can see from the pictures, these bones are rich with character. Some of the bones are knotty, some are not. And a select few pairs sport small nail holes which are environmentally fashionable - and yours at no additional charge. At around 1.5 ounces per pair, they are a smidge heavier than regular Danforth Pine Bones, which I think is an advantage. So if you want to try a "feather-light" pair of bones that are environmentally friendly and sound about as pleasingly soft as musical rhythm bones can get, then these Danforth Pine reclaimed bones are for you. Poplar is a soft, lighter-weight domestic wood that delivers a medium bright tone. The wood is yellowish brown to olive green and sometimes streaked with dark green, purple, black, blue or red. Reclaimed Red Oak from old floorboards or other sources looks great...environmentally friendly too. "We've started making bones out of old pieces of oak flooring," the folks at Danforth Bones tell me. "They're beautiful, though the color and grain will not necessarily match in each pair since we're using salvaged wood." As you can see from the pictures, these bones have lots of character - and maybe even a worm-hole or two! Oak is a symbol of strength and endurance and the trees are very sparse, which pretty much sums us bone players up. Historically, oak holds a reputation as the preferred material for barns, sea chests and - some folks might view this with a nod towards bone players...hanging trees. If you like ebony bones, then you will absolutely love rosewood. Yes, the wood of choice for Mister Bones during the Minstrel era was ebony. But rosewood was also prominent, and vintage rosewood bones continually surface in antique shops. Rosewood is a strong heavy wood that often features an extraordinary appealing grain. Its density and excellent resonance enable you to deliver a loud, sharp tone that most other woods cannot match. In 1897 you could buy a set of four 7" rosewood bones for twenty cents in the Sears, Roebuck & Co. catalog. Living history performers will want to choose rosewood bones for the sharp tone that outdoor crowds can hear, and for its historical significance. What the heck are virgin maple bones? The wood for these bones comes from "virgin" maple trees. Also known as "old growth" wood, these venerable maple trees grew for hundreds of years in a forest that had never been logged before. Enjoy the warm pleasing feel of walnut. Walnut is among my favorite woods. My first pair of wooden bones were walnut. This chocolate colored wood is prized by fine woodworkers as a malleable material that also emits a pleasingly distinctive aroma. I particularly like the feel of walnut. New and experienced players alike enjoy the medium heft and medium-low tone of walnut bones. They are perfect for most any rattlin' situation. White Ash is a medium-density wood that grows in the United States and Canada. White Ash is among the "10 Tallest Trees In Michigan," reports the Michigan Botanical Club. At 131 feet tall, a White Ash in Leelanau county (2006) was listed in the "Michigan Big Tree Register" as the 10th tallest tree in Michigan. These bones are made out of floorboard scraps from a Michigan flooring manufacturer. "They'd just be throwing it out," says San, a professional musician who has been making Danforth Bones the past ten years, adding, "As you probably heard, most of Michigan's ash population has been killed off by the emerald ash borer, so these bones will be even more special." Indeed. A recent update from the National Arboretum reports that "the emerald ash borer has killed more than twenty-five million trees." And Dr. Deborah G. McCullough, a member of the American Forests Science Advisory Board and professor of forest entomology at Michigan State University says, "The emerald ash borer, an Asian insect first identified in Detroit, Michigan in 2002, has become the most destructive forest insect to ever invade the U.S."
So if you would like a pair of warm sounding, strong-toned bones reclaimed from what sadly might be the last remaining Michigan ash trees available for commercial production, then order a pair or two now before the supply completely runs out. Reclaimed White Oak from old floorboards or other sources looks great...environmentally friendly too. The folks at Danforth Bones recently "found a huge supply of old floor boards" and you can get these reclaimed oak bones while supplies last. The color and grain will not necessarily match in each pair since they are crafted from salvaged wood. As you can see from the pictures, these bones have lots of character. And with any luck you might find a pair with a worm-hole or two! Oak is a symbol of strength and endurance and the trees are very sparse, which pretty much sums up us bone players.